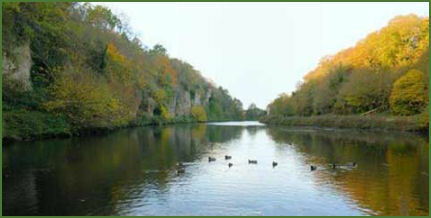 Creswell Crags is a picturesque ravine flanked by limestone cliffs and is situated near the village of Creswell on the Derbyshire border with Nottinghamshire. 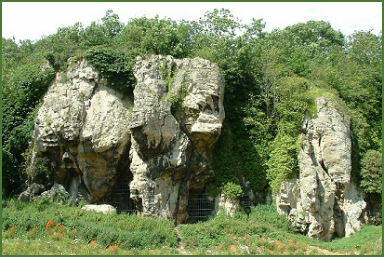 The cliffs of the ravine contain several caves that were occupied by hominids during the last ice age, between around 43,000 and 10,000 years ago. The network of caves and rock shelters have preserved much evidence of human activity dating back thousands of years and are amongst the most important archeological sites Britain. The first occupants of the Cresswell Crags caves were Neanderthals who were followed the herds of reindeer, bison, mammoths and horses, they left behind flint hand axes, tools and animal bones bearing traces of butchery marks. Around 30000 years ago the first homo sapiens, anatomically modern humans, used used these natural shelters as seasonal camps while they tracked migrating mammoths and left more advanced flints as well as shaped bone and antler tools. Mother Grundy's Parlour, flint tools and split bones have been discovered at this cave which was occupied until the Mesolithic period. Robin Hood's Cave, the largest of the caves at Cresswell, from which was recovered the horse head-engraved bone and evidence that its occupants were hunting and trapping woolly rhinoceroses and arctic hares. Church Hole, this cave has more than 80 engravings on its walls and was occupied intermittently until the Roman era. All of the caves are protected by metal grills to preserve the rare archaeological deposits that remain inside. There is an interesting award winning visitor centre and museum at the east end of the ravine, where stone tools and Ice Age remains are on display. The centre operates two types of tours, the young travellers tour is designed to appeal to younger visitors and the Life in the Ice Age Tour where the visitor can explore what life was like at Cresswell Crags in the stone age. A bone carved with a horse's head, known as the Robin Hood Cave Horse (previously known as the Ochre Horse) was found in Robin Hood's Cave at Cresswell Crags, (pictured left) it is now housed in the British Museum. A replica of the artifact is displayed at the Creswell Crags Visitor Centre. Decribed by Professor Sir William Boyd Dawkins, who carried out excavations at the cave in the 1870's as "the head and fore quarters of a horse incised on a smoothed and rounded fragment of rib, cut short off at one end and broken at the other. On the flat side the head is represented with the nostrils and mouth and neck carefully drawn. A series of fine oblique lines show that the animal was hog-maned. They stop at the bend of the back which is very correctly drawn . . .". The tooth of a Machairodus or sabre-toothed cat was found at the same time. An engraving of a human figure on a woolly rhinoceros rib bone, known as the Pinhole Cave Man, was discovered the Pin Hole Cave in 1928 by the archaeologist A. L. Armstrong. This carving dates to the Upper Palaeolithic and is about 12,000 years old, it is now also kept at the British Museum. The carving is 5 cm tall, the whole bone measures 20.8 cm long. The man may be wearing a mask, or he is just depicted with a protruding nose and jaw. He has legs that appear incomplete, a crooked back, and a long engraved line across his upper body. Other worked bone items along with the remains of a wide variety of prehistoric animals, including mammoth, lynx, bear, deer and hyena, have been found at the caves in excavations from 1876 to the present day. In 2003, the first British examples of cave art (above right) were discovered at Church Hole Cave by Paul Bahn, Paul Pettitt and Sergio Ripoll, carved in to the walls and ceiling of the cave. These have been dated to about 12,000BC from the deposits of dripstone on top. Now recognised as the most extensive collection of prehistoric bas-reliefs in the world, it had previously been thought that no British cave art had existed. Subjects include representations of over 90 animals including bison, deer and several different bird species or females. Most of the engravings are to be found in Church Hole Cave. Leave the M1 at junction 30 and take the A616 towards Creswell. Turn left on to the B6042, Crags Road to reach thecar park at the visitor centre.